This is a truly gorgeous costume. The deep blue velvet dress is trimmed with gold ribbon and white satin. 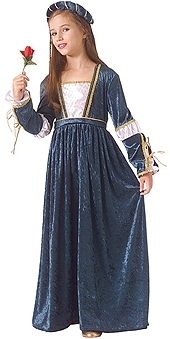 There is lacing detail to the sleeves, and the dress comes complete with the head piece.